Complement system consists of approximately 20 serum proteins that interact with each other and other components of immune system to eliminate the intruder. These are proteins that work as a team, one activating the other or as a biological cascade. opsonization that is enhancement of phagocytosis. Several complement components are enzyme precursors or proenzymes which are cleaved to form active enzymes. These systems are activated either by antigen antibody complexes or by toxins or antigenic fragments. Alternative pathway:Sometimes microorganisms or its toxins can directly activate complement system, which is an innate and non-specific reaction. Sooner microorganisms are coated by complement molecules leading to its uptake by phagocytosis. 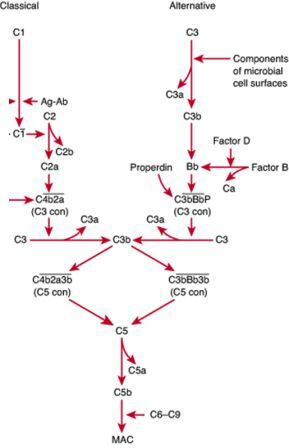 C3b: is the central molecule in the complement cascade in both the pathways. It generates C5 convertase, a vital enzyme responsible for the production of membrane attack complex. It opsonises (enhancing phagocytosis) bacteria as phagocytes have receptors for C3b on their surface. Chemotaxis: attracting cells of the immune cells to the site. C5a attract neutrophils. Anaphylatoxin: C3a, C4a and C5a causes release of inflammatory mediators like histamines. Opsonisation: Presence of C3b enhances phagocytic activity of phagocytes. C3b receptors are present on the surface of many phagocytes. Enhancement of antibody production: B cell has C3b receptors on its surface. Binding of C3b to its receptors on activated B cells greatly enhances antibody production compared to B cell activated by antigen alone. In short, complement system plays a major role especially in non-specific immune defence.